To explore a complex problem, it is necessary to identify possible solutions and then develop a plan of action. A diagram that visually explains the stages of researching the problem can help find the structure of the problem, and then determine what tasks need to be solved. This diagram uses symbols to assign who participates, performs, consults, should be informed, checks the work, and accepts the results. Using visual diagrams keeps ideas clear and is very effective when discussing the problem and a description of the solution. They are great at helping to quickly see what stage of the problem-solving effort is currently underway. Diagrams save time by simplifying communication and adding valuable structure to the problem-solving process. The Involvement Matrix is constructed for all highly prioritized corrective actions. It defines the participants and their roles. The matrix displays all of the parties involved, defines their level of involvement, and the nature of their participation. 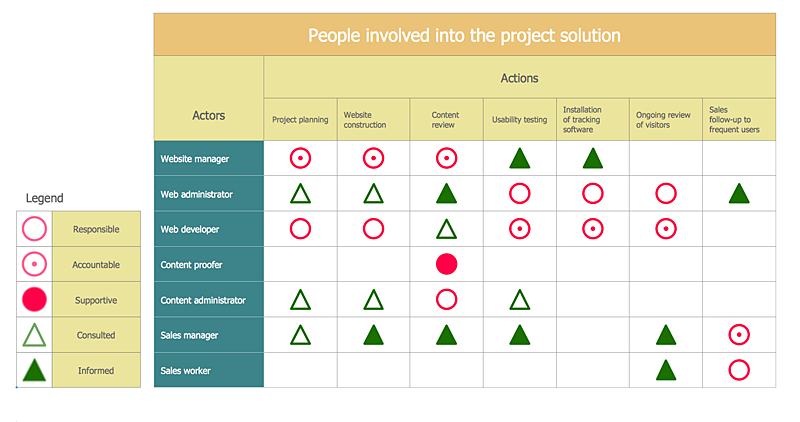 Reveal the Seven Management and Planning Tools item in the Solutions panel. Click the template preview to open it in ConceptDraw DIAGRAM. Set the number of columns and rows (actions and actors) in your matrix. Use the Action menu . Enter corrective actions and roles (actors). Use the Format panel to get your matrix at a glance. Result: Now you have responsibilities assigned: who participates, who performs, consults, who should be informed, who checks the work, and who accepts the results.